WASHINGTON — With only a year left before Boeing must meet a contractual obligation to deliver 18 KC-46 tankers to the Air Force, the program has been hit with three “category one” deficiencies — including one that could affect the service’s willingness to accept the aircraft from Boeing. 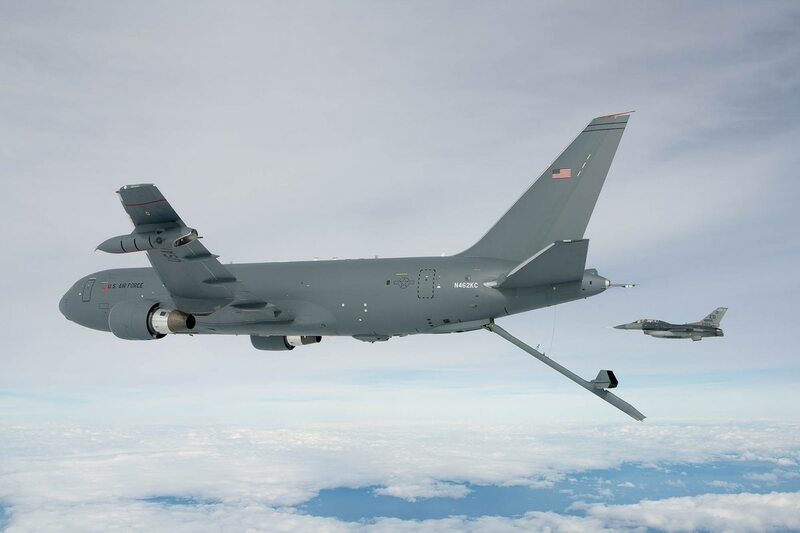 This May, the Air Force discovered that during October 2016 testing, the KC-46 was responsible for a number of incidents where its boom scraped the surface of the aircraft being refueled. Furthermore, the tanker is not detecting when it is missing the receptacle, making it impossible for a KC-46 pilot to communicate that the receiving aircraft has potentially been damaged, the Air Force disclosed Friday. The service is conducting root cause analysis to understand what might be causing the issue and is also reviewing historical data to see how often this occurs during current operations. It also will collect additional information from upcoming tests of the boom and aerial refueling demos with various receiving aircraft. It could also pose a problem for refueling stealth aircraft like the F-35 and F-22, which are covered in a special coating that bestows low observable properties to the aircraft. The KC-46 has not yet refueled a stealth aircraft, but Shipton acknowledged that a more serious scrape could impact that aircraft’s ability to be detected. “This does happen in the current fleet, and we need to characterize this as compared to that data so that we better understand [whether we are] in family or out of family with what the fleet is already experiencing,” she said. For the time being, Air Force officials still believe that Boeing will work through all three deficiencies in time to deliver the first KC-46 in late spring of 2018, with a contractually mandated “required assets available” deadline for 18 tankers following in October. But Shipton left the door open on whether the Air Force would accept aircraft from Boeing if the problem was not fixed, and at this point the timeline for resolving the issue is yet to be determined. The other two deficiencies — although still category 1 — appear to be less serious in scope, and the Air Force hopes to resolve them as early as October. The first involves the KC-46’s high frequency radio. When any tanker refuels an aircraft, it is standard practice to turn off the high frequency radio. An Air Force official told reporters on background that there is no reason to believe there’s an issue with the radio itself, but more data is needed to confirm that the radio will remain off when turned off, even if various systems fail. Once that testing is done and analyzed in October, the service believes it will be able to close that deficiency report. The second deficiency occurs when fuel is turned off quickly and the KC-46’s refueling boom disconnects, pushing itself forward into the receptacle. This issue also occurs in the legacy tanker fleet when a receiver aircraft disconnects from the boom, said an Air Force official speaking on background, who added that normally the tanker cuts off fuel from the receiving aircraft and retracts the boom. When this issue occurred during ground tests, the KC-46 hit the test stand with an undesired degree of force, but the official noted that the test stand was not rated to withstand that impact. Because the average aircraft receptacle can withstand 10 times the amount of force as what has been encountered during testing, the Air Force believes this issue isn’t a major problem. However, more testing needs to be done on the outer edges of the KC-46’s flight envelope. Like the radio issue, the service hopes to resolve this deficiency in October.